Put on an apron, slice up your favourite ACE Bakery bread and let your taste buds lead the way! Chef Lynn Crawford and ACE Bakery today announced a search for the most sensational sandwich recipes this country has to offer through Canada’s Best Sandwich Contest. Better yet – the winner will be announced just in time to add the new recipe to your family’s summer menu! It’s time to put your secret chipotle mayonnaise recipe to the test. Canada’s Best Sandwich Contest will be accepting recipes on the ACE Bakery website (acebakery.com) from now through May 24, 2012. Submissions will then be reviewed by Chef Lynn Crawford and ACE Bakery and scored based on their taste appeal, creativity, innovation and originality. “Experimenting in the kitchen is one of my all time favourite things to do,” says Linda Haynes, ACE Bakery co-founder, and author of the ACE Bakery cookbooks. “If you’re new to creating recipes, sandwiches are a great place to start – simply choose a combination of fresh ingredients that you love and start building. Also be sure to take risks, you never know what will taste great together"
On June 4, one regional finalist from Western Canada (including British Columbia, Alberta, Saskatchewan and Manitoba), Ontario, Quebec and Atlantic Canada (including New Brunswick, Prince Edward Island, Nova Scotia and Newfoundland) will be announced. Each regional winner will be awarded a $1,000 cash prize, as well as a $1,000 donation to their charity of choice. The regional winners will then be invited to Toronto to participate in the contest finals on June 22, where they will prepare their own recipes in front of a live audience. Chef Lynn Crawford, Linda Haynes, and Marcus Mariathas, ACE Bakery’s master baker, will judge the final creations and decide on the winning recipe. The creator of the winning recipe will be awarded an additional $5,000 cash prize and $5,000 to donate to their charity of choice. Now one of North America’s leading artisan bakeries, ACE Bakery opened in 1993 as an artisan bakery creating hand-made, European-style rustic breads. The gentle shaping of each loaf, long fermentation periods, and a stone deck oven all work to create exceptionally flavourful bread with a pleasing texture and crisp crust. The breads contain no preservatives and are made with the finest ingredients. 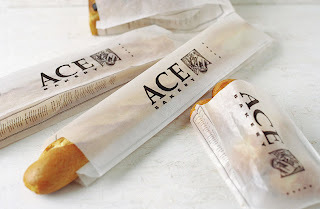 ACE Bakery’s baguettes and artisan breads are available at hundreds of restaurants, hotels, caterers, grocery and gourmet food shops across Canada, throughout the United States, and as far away as Bermuda.